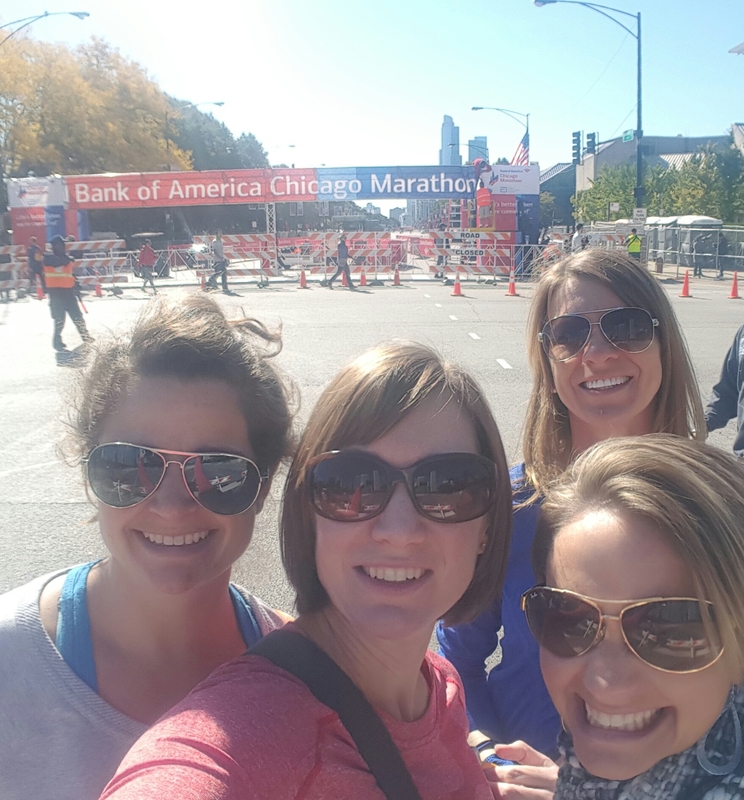 The Chicago Marathon 2016. 45,000 Runners going the full distance. The weather was 55 degrees of perfection. I had trained harder for this race, than any other. I stood on the starting line feeling rested and strong, with no excuses not to run my best race. Marathon training for me is more about the camaraderie of the process. Seriously, who wants to get up at 4 am in the dark and run by themselves? 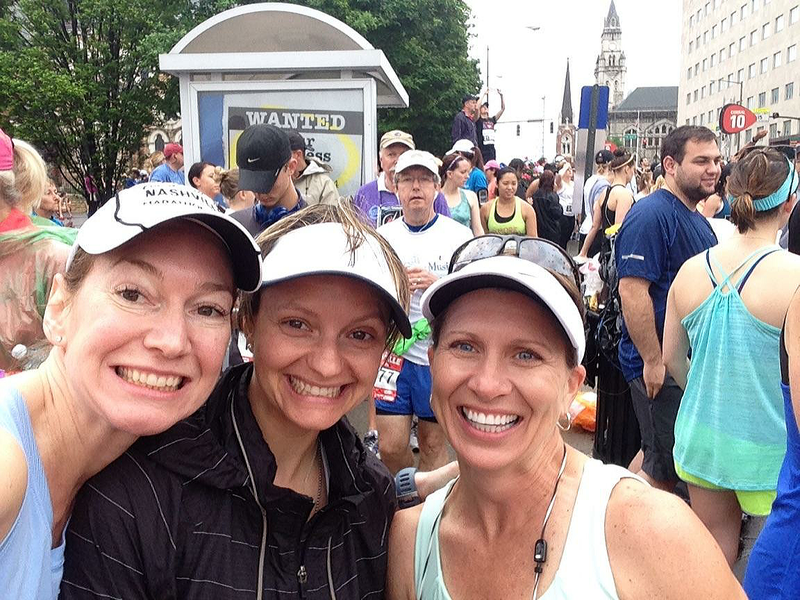 I trained and traveled with 3 fabulous runners who also happen to be my dear friends. Our last marathon was also the first for Abby, Christina and myself (Shannon’s our veteran). 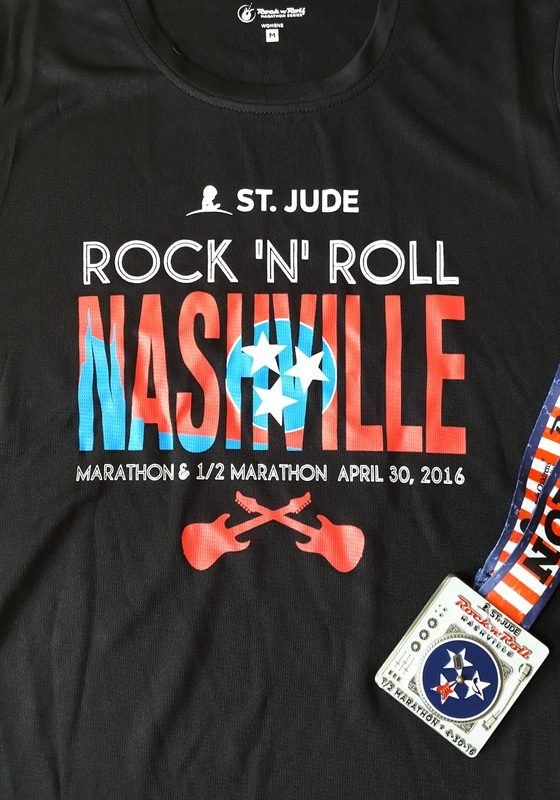 When we tackled the hills of Nashville in 2014, our goal was simply to finish. I did complete it, but I crashed brutally into the “wall ” at mile 16 and never fully recovered for the rest of the race. 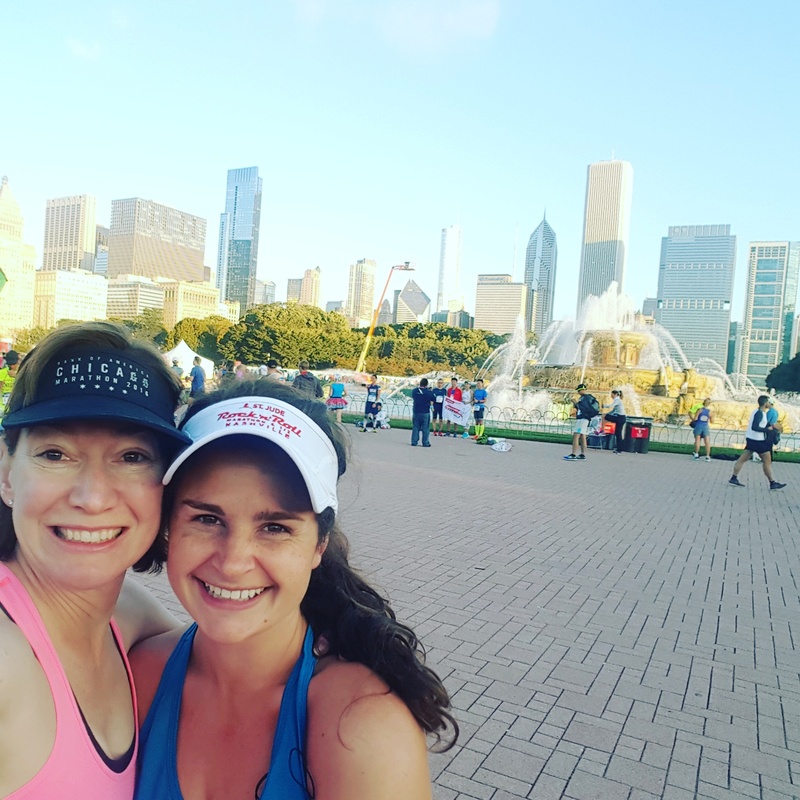 Chicago for us was not about just finishing, it was about finishing fast ….at least “fast” for middle age suburban moms. 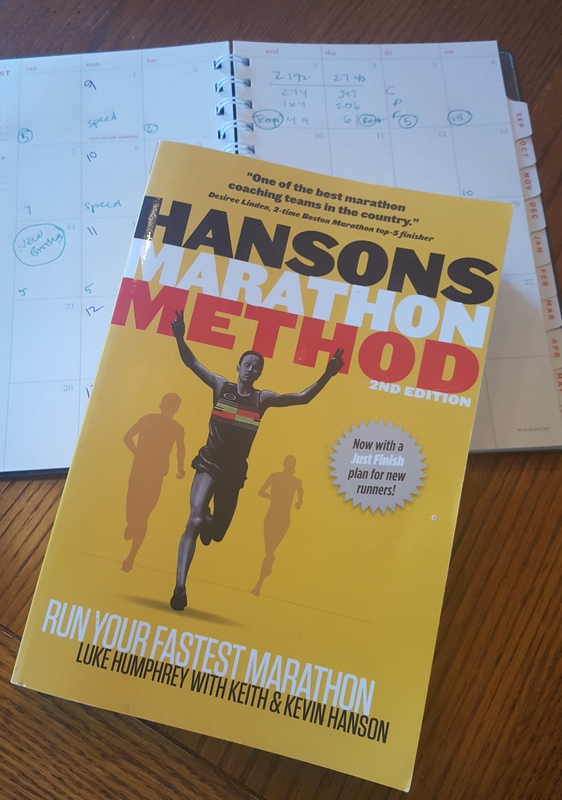 We read The Hanson Method book and followed the training plan excruciatingly well. It calls for 6 days of running, including intense speed work and blister making tempo runs. The plan packs in a ton of mileage but keeps the “long” runs at 16 miles every other week. We pushed each other to give it our all. 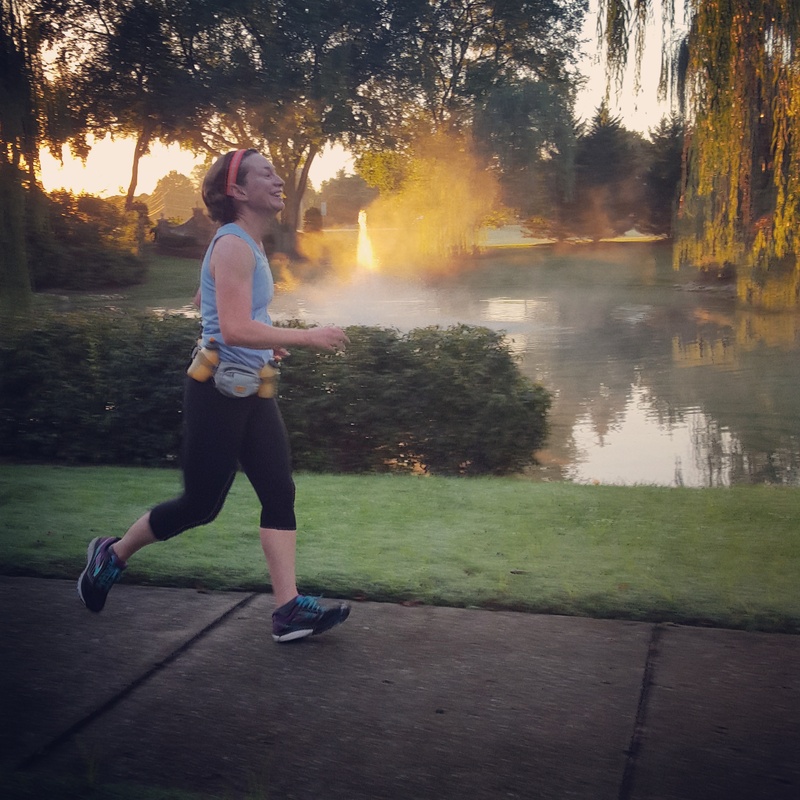 I can’t can’t imagine training for a race alone, especially the grueling tempo runs. Even when we couldn’t physically train together due to our hectic schedules, we were constantly texting each other encouragement and/or complaining about how every last fiber of every single muscle in our legs was tired. Despite the intensity of the training we were all a little worried about the lack of the classic “20 miler” in our plan. When we boarded the plane from Nashville to O’Hare on Friday, we left behind 10 kids, 4 husbands and all our responsibilities. We were all giggles on the way to the airport. We were going to Chicago. To Run a Marathon. Without Children! It was definatly helpful to go up 2 days before the race to have plenty of time to rest and hydrate before hand. I was all nerves as we checked in to the hotel (the ‘W’ on Lake shore drive). The training had consumed so much of my most prized commodity: my time. 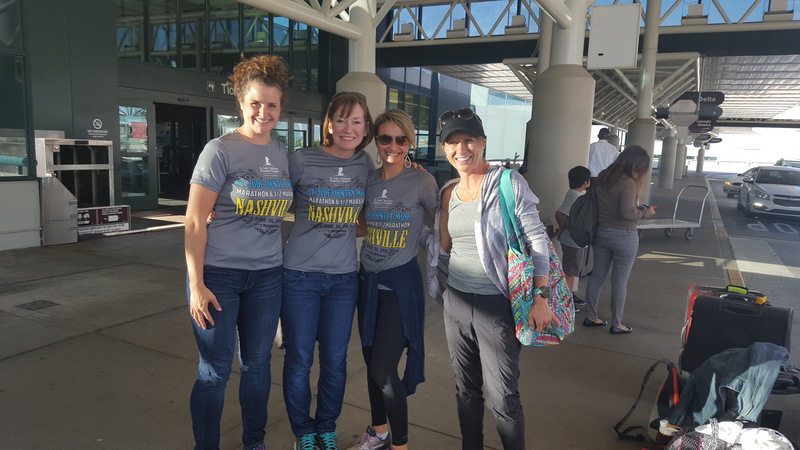 As much as I wanted this opportunity to prove myself and finally have a few days of down time (yes, I consider running a marathon “down time”), there were many times I had felt selfish for choosing to run this race. Granted most of my miles were run before my kids/ husband even woke up, but working mommy guilt is often not logical. Regardless, I didn’t want my training to be in vain. I don’t get the chance to do this often. I wanted it to count. 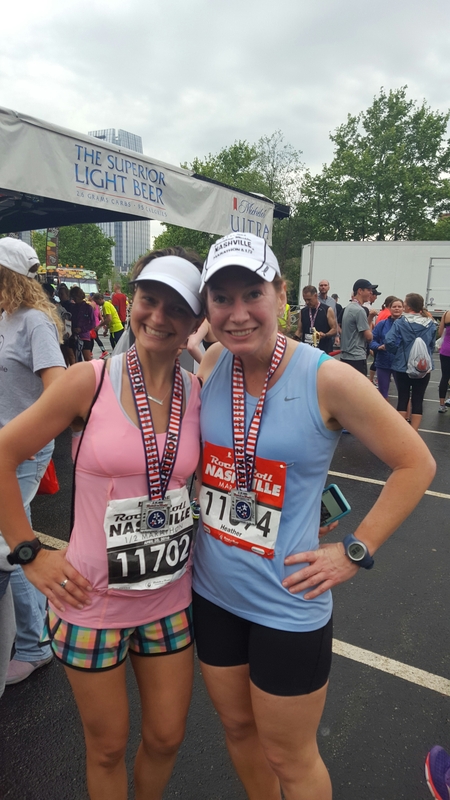 I tried to follow all the rules including cutting out sugar and alcohol and keeping my caffeine to a minimum (one small cup of coffee… which for a busy OB/GYN isn’t nearly enough) the week before the race. I counted my carbs, which consumed 70% of my calories; which is annoyingly hard when you are not eating sugar. However, I did make an exception that was well worth it. Our dinner Friday night at Geja’s Cafe. 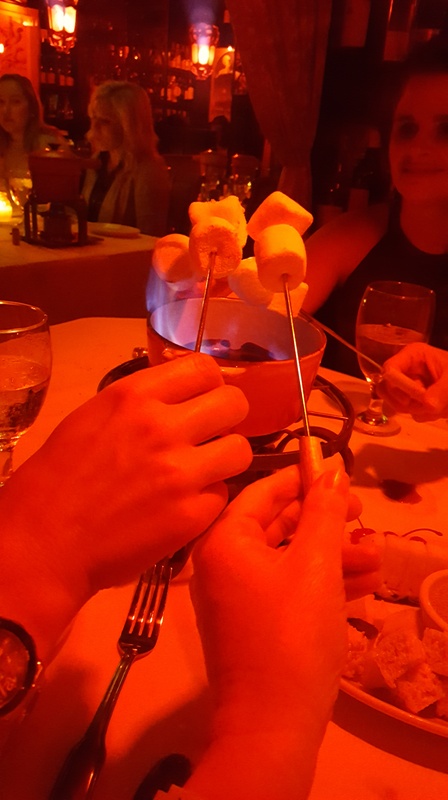 I always eat at this quaint fondue restaurant when I’m in Chicago. It did not disappoint. The food, wine and atmosphere were spectacular. We rested surprisingly well, considering we all stayed in one room. The rooms at the W were quite small so I wouldn’t recommend 4 adults in a double, but we made the most of it. Saturday we slept in and ordered room service coffee. 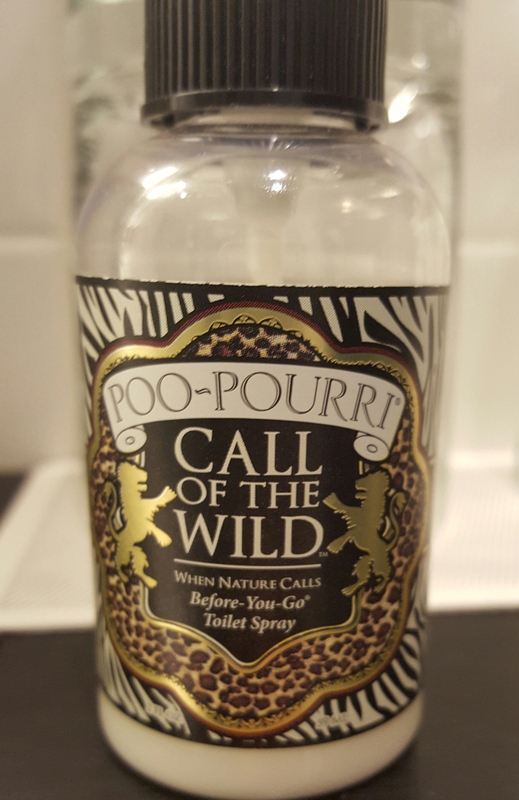 It cost a million dollars, but was worth every delicious drop. We scarfed down a breakfast of pancakes and then made our way to the expo. We walked a mile down Michigan Avenue to catch a shuttle from the Hilton. The skies were crystal clear and a brisk breeze wafted off Lake Michigan. It was a perfect day and the weather man promised race day to be its equal. The city was full of runners and you could feel the excitement in the air. The expo was ginormous and by the time we made it there, I think all the other 45,000 runners were also there. I would have loved to spend hours browsing the booths, but we were determined to save our legs. The convention center that the expo was held in was confusingly huge, and we had trouble getting an Uber back to the hotel. When we finally did head back to the hotel, we got stuck in traffic. It seems that President Obama had come to watch us run as well. While that was nice of him; his motorcade kept shutting down the roads. The night before the race, we ate pasta in the hotel restaurant and headed to bed early. As much as I love Chicago, this was not the time for sightseeing or late nights out on the town. This was time for race prep. With 4 marathoners sharing the same bathroom, this came in quite handy on race morning. Race morning I ate a bagel with peanut butter and banana, chugged as much water as possible, and headed out. The hotel lobby was packed with runners; the air was electric with race jitters. We were about a mile from the start and decided to walk rather than try to catch an Uber. In hind sight, we would have been fine driving, but I was worried about road closures and getting stuck in traffic. We walked down Michigan Avenue then entered into Grant Park for bag drop and one last trip to the plentiful port-a-potties. Standing in the corral, I once again began to doubt my training. Per the Hanson Method training plan, I had never ran more than 16 miles… could I really run strong for 26? My mantra became “trust the process and stick with your plan.” I was determined to not go out too strong, so I had set my Garmin to alert me if I was going too fast for the first 20 miles. Sometimes it seems that you are in the corral forever, but it was only a few minutes before I crossed the start line. As I ran through the city over the first few miles, the spectators were several people deep cheering on the runners with the typical cache of funny signs and encouraging mantras. But it wasn’t just the first couple of blocks, there was crowd support for the entire 26.2 miles. Not simply people standing there bored, staring at the phones and looking up at you annoyingly as you pass by because you are not their wife, but people cheering their heart out for every random stranger. I had read this about the Chicago Marathon, but I thought it had to be an exaggeration. It was completely true: the crowd support was amazing. The first 13 miles my hips felt sore and tight, not painful but I was worried they would get worse. Thankfully they loosened up at about mile 14 and didn’t bother me anymore. I tried to keep my pace around 8:50, but my Garmin was off due to all the buildings. It was hard to know exactly how fast I was going. I was definitely conservative in the first half. Despite 45,000 people running the race, the course was not too crowded. I made sure I fueled frequently, taking in either a GU or gatorade every 4 miles. 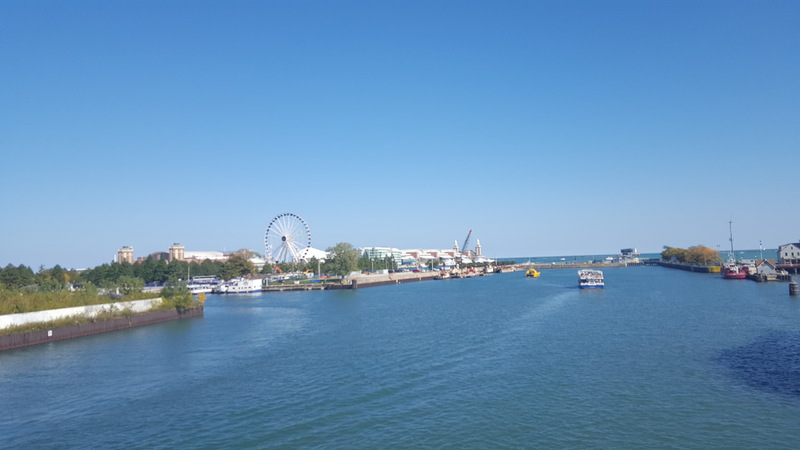 I loved running through downtown, across the bridges and down the middle of famous streets with the breezes off Lake Michigan keeping me cool. Mile 16 came and went in a blur, and when I rounded the corner at mile 20 I felt strong. I realized the the Hanson method had worked. I didn’t hit “a wall” instead I put a determined smile on my face and picked up my pace for the last 10K. The last few miles I started getting texts from my family on my Garmin. I got an extra bolt of much needed adrenaline knowing that my family was cheering me on from 2 states away. When I saw the finish line, I started to cry. I had done it. I wasn’t sure of my time at that point but I knew I had ran my best race. I had trained hard and ran smart. I finished strong and ran the second half of the race 6 minutes faster than the first. At 3:54 it was a 30 min PR for me. That crazy Hanson Training Method had worked. The volunteers at the finish line were so excited. I cried again when they put the medal around my neck, overcome with emotion and exhaustion. As I walked the famous 27th mile after the finish line, I felt euphoric. I was a real athlete. A competitor. During those 26.1 damn miles I wasn’t a 41 year old mom, wife, doctor, friend or Sunday school teacher. I was just Heather, proving to myself that I could do something I never thought I could do in my wildest dreams: run a sub 4 hour marathon. We all finished within 10 minutes of each other. After downing a celebratory beer, we hobbled back to hotel. The mile back felt more like 17 miles at that point. Fourluxurious showers later, we went out and ate our weight in Chicago style pizza. We slept like babies that night and headed home the next morning with new medals in our suitcases and giant grins on our faces. We are smiling because we are DONE! Abby also finished sub-4 with a time of 3:56. 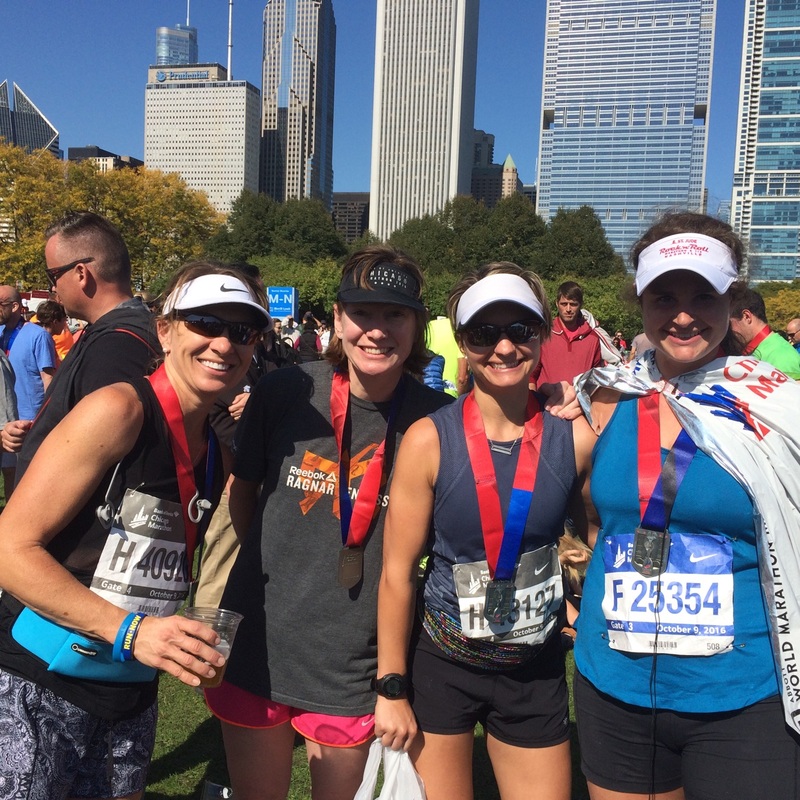 This entry was posted in Running and tagged Chicago marathon, Hanson Method, marathon, marathon training on October 27, 2016 by drrupe. I am on week 13 of my preparations for the Chicago Marathon and I’ve reached the point in my training where I have begun to doubt my sanity. I’m averaging about 50 miles a week, by rising so early that the glowing digital numbers of the clock often make me cringe when I set my alarm. I dream about GU and rest days. My foam roller is my best friend. Actually, there is no doubt, I’m likely insane. 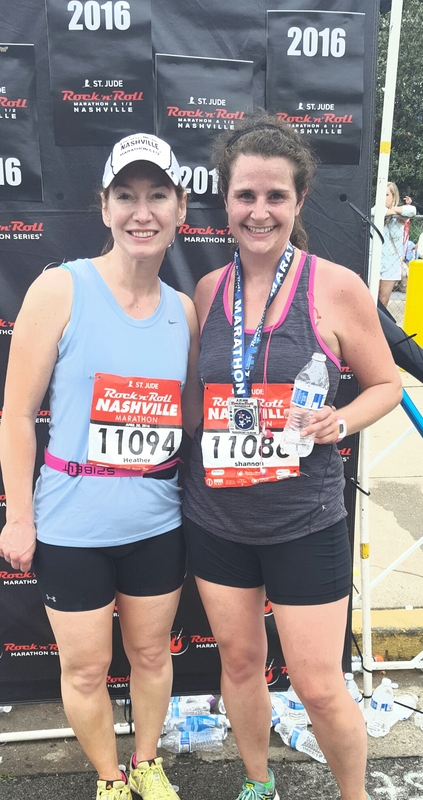 I ran my first marathon in Nashville a couple years ago and made all the rookie mistakes. 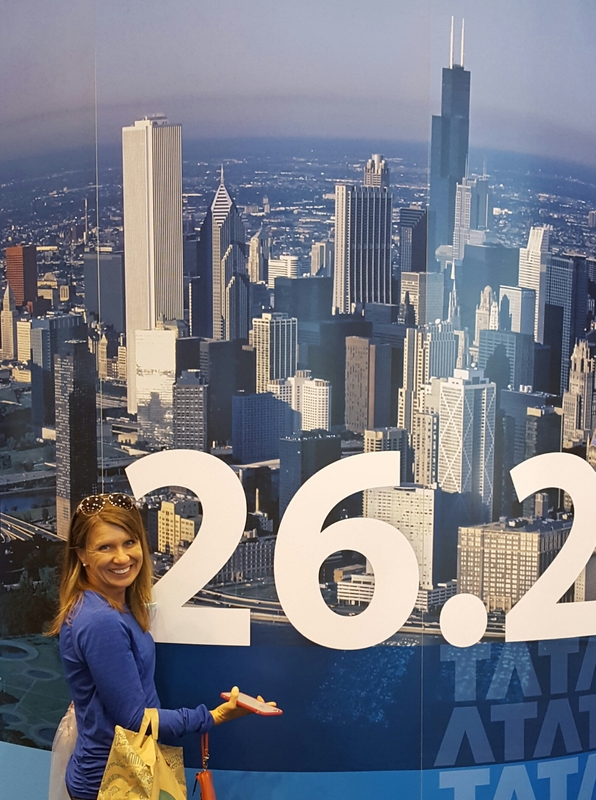 When my running buds decided to put their names in the hat for the Chicago marathon lottery, I couldn’t resist the chance to run the windy city and hopefully redeem myself on a flatter course. When all four of us got bibs we were ECSTATIC. However we quickly calmed down and realized we had to to actually start training for this monster. The commitment that it takes to put in miles to properly train for the most honored of distance races, is not something I take lightly. Last time we went with the good ol’ Hal Higdon training program. At the time I felt like the training was going well, but due to combination of heat, hills and going out too fast I crumpled at mile 20. I wanted to try something different this time, so I decided to go with The Hanson Method. This plan skips the super long runs and instead embraces the philosophy of “cumulative fatigue” (I often insert some more colorful adjectives to this term under my breath when I’m on my 54th mile of the week, but since my grandma might read this, I’ll leave those to your imagination). By spreading the mileage out over the week and focusing on speed work and tempo runs the Hansons hope to train your legs to improve their lactic acid threshold (that’s fancy talk for teaching you how run with stupidly tired legs). There is only one rest day and they down play the need for crosstraining and weight lifting (so no crossfit for me lately). How do I like this training? After a particularly painful speed workout, we recently googled Mr Hanson’s home address to determine the feasibly of toilet papering his house but alas, luckily we were too stinking tired to follow through on our plans with all the cumulative fatigue. Joking aside, the training seems to be going well. My legs are tired, but nothing hurts and I’m rarely sore. I’m actually really enjoying the the challenge of the speed work. Even though the mileage is higher, the plan seems to work better with my schedule since my entire Saturday is not wasted on running. I guess we’ll find out in October how well it really works. Despite a full schedule I have only missed 1 run so far this summer. Usually when I’m on vacation, I don’t always run everyday if I’m walking a lot, but this summer I stuck with the plan no matter where we ventured. 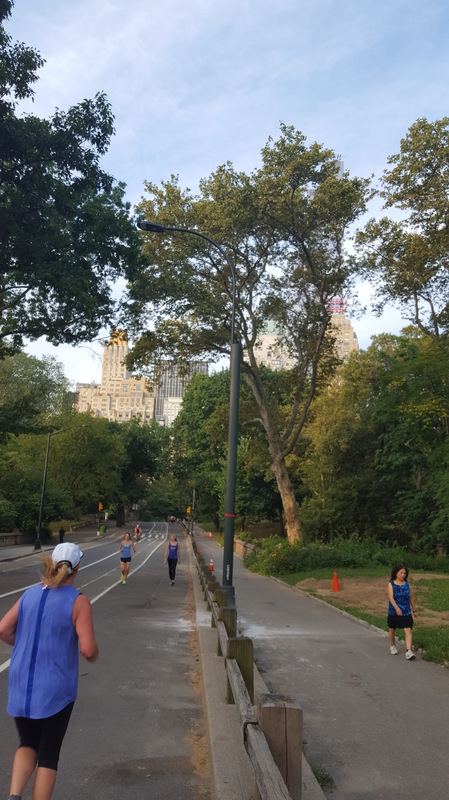 On a recent trip to NYC I ran 10 miles one morning only to walk an additional 11 miles around the city throughout the day. I slept quite well that night. Birthday run in NYC. 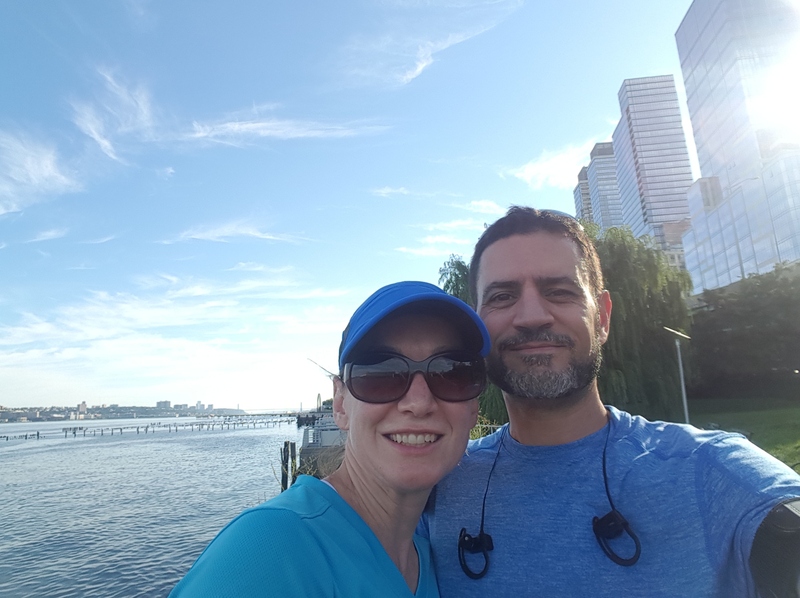 We ran through the “Highline” and then along the Hudson River trail. 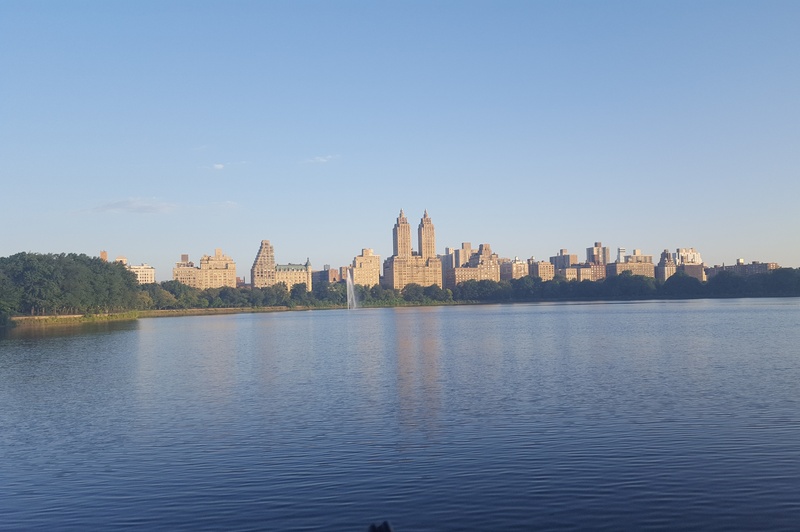 I felt very safe running in Central Park. However, it was far hillier than I expected. 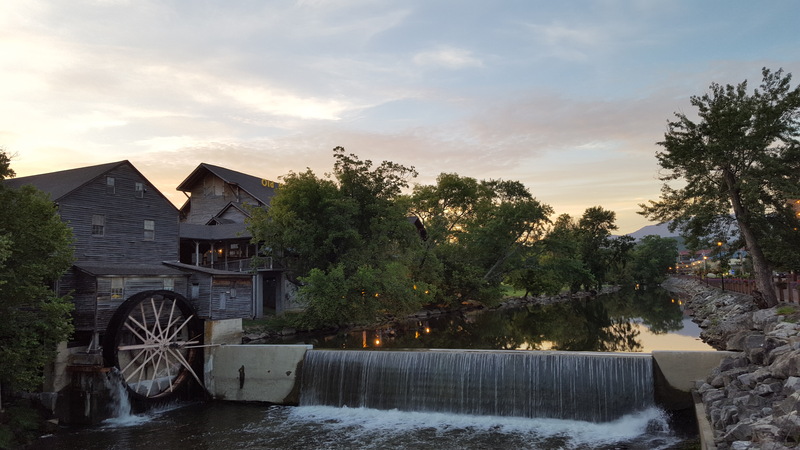 Running through Pigeon Forge on another weekend trip, I ran past this quaint old mill at sunrise. I have 2 new pieces of running gear that I AM CRAZY about. First is my Garmin 235 and second are my perfect running shorts. If I know you IRL you can skip this next paragraph because I am sure I have already told you how much these items have improved my running life whether you wanted to hear about them or not. My old Garmin went to GPS heaven (which is ironically difficult to find) right as I started marathon training. I got the Garmin Forerunner 235 as a replacement and I love it so much that I want to marry it and have little Garmin babies. It is a combination running watch/ smart watch. I can and do wear it all the time. It tracks your heart rate on your wrist and sends your texts from your phone. You can program it with training runs and it will prompt you with a vibration if you get off pace. I have found this especially helpful for a tempo run. 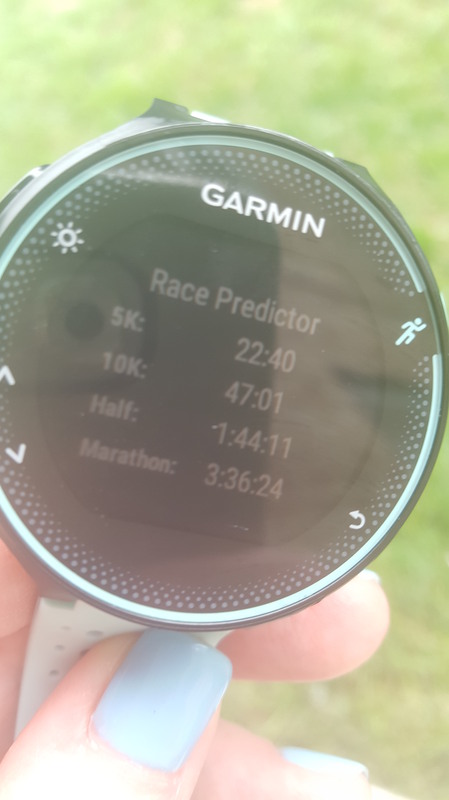 Recently I discovered that it can also predict your “race finish time” which I found a little presumptuous, until a friend who has run a million marathons told me his watch accurately predicted his PRs. When I checked my predicted marathon time my jaw hit the floor. MY WATCH THINKS I CAN BQ (that’s qualify for Boston, for you non- runners… not that any non runners would read a entire paragraph dedicated to praising a fancy running watch). I have very mixed emotions about this. While I’m pleased my watch thinks so highly of me, I do feel now feel a little pressure to up my goal time. I was originally planning to try for sub 4 hours, but now I know that my watch thinks I can run 3:36! I feel like an Olympic gymnast who’s coach tries to push over her limits; not caring that I have sprained ankle, but demanding I do the vault anyway. Being blessed with “athletic quads,” I have a hard time finding running shorts that I can tolerate, let alone really like. Most traditional running shorts chafe and a lot of biking style shorts are too short for me. My new Lulu Lemon Speed track shorts are the perfect length, comfortable, don’t chafe and have pockets on each side that are the perfect size for my smaller water bottle. I have now bought them in every color. 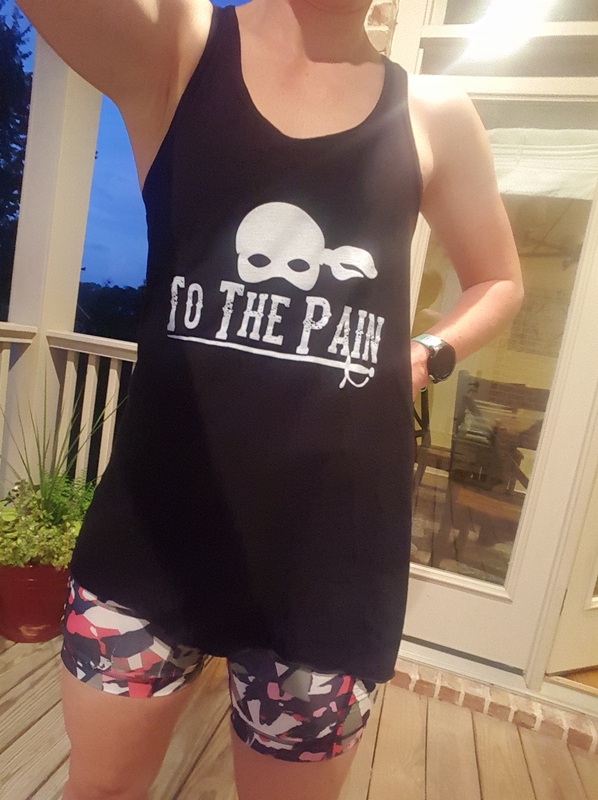 New shorts accompanied by what has to be the best running shirt ever. While my first marathon training took place during a crazy cold winter, this time I’m training in heat and humidity. Even in the wee hours of 5 am when we are often out pounding the pavement, the air already feels like jello. Well, hot jello. I guess it feels more like pudding, but you get the point. I’m not sure which is worse, running through pudding or tundra; but I’m definitely learning the art of electrolyte replacement and hydration. The car gets really stinky when you’ve just ran 16 miles in 90% humidity. We have 7 weeks to go and I’m feeling ready. My planned pace is 8:50 which would give me a finish of 3:50. Faster than my original goal, but not as crazy fast as my “smart” watch wants me to run. This pace has felt comfortable in my tempo runs. Plan A is to run negative splits so I may start out a little slower, so I can finish strong. Plan B is to finish and have fun. Regardless, I looking forward to running down Lake shore Drive in October. 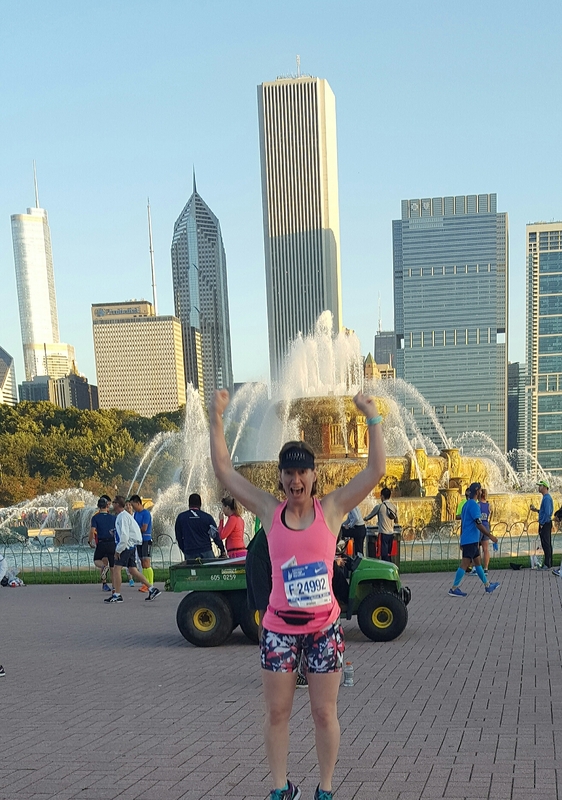 This entry was posted in Running and tagged Chicago marathon, garmin, lulu lemon, marathon training, Running on August 30, 2016 by drrupe. 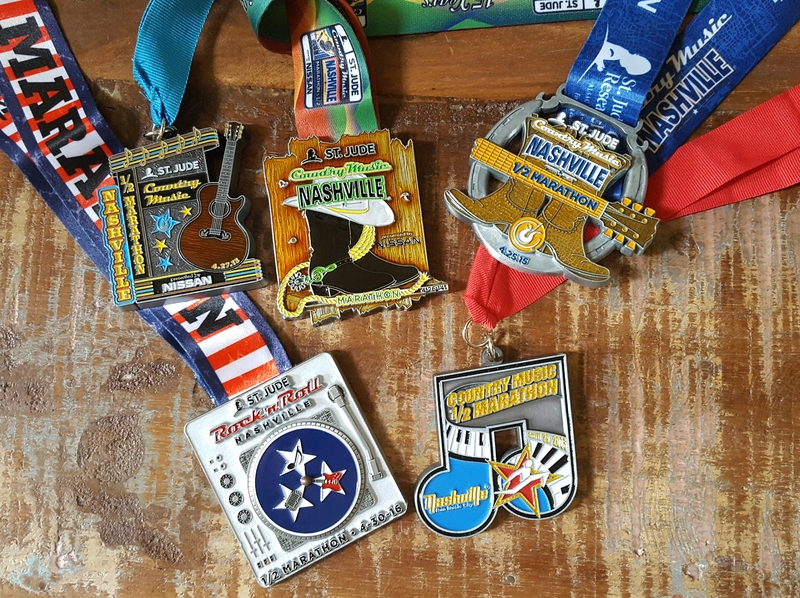 First off, Yes, I’m aware that you have pretentiously changed your name this year and you are now preferring to be called the ” St. Jude Rock ‘n Roll Nashville Marathon and half Marathon.” But Nashville, is the home of country music and you and I, we have a long history together. In my heart you will always be “The Country Music Marathon.” So, CMM, let’s move on. I’m simply going to come right out and say it: I’m breaking up with you. I would like to say that it’s not you, it’s me; but we both know that it’s you. It’s not that we haven’t had some good times together. We have. There was 2013 when, despite the torrential rain and 45 degree temperatures, I set a PR of 1:53. When I crossed the finished line and saw my time, I was so ecstatic I could barely contain my joy. However, the hypothermia I got while waiting for my ride in the rain did put a damper on the overall experience. This year was our fifth year together and despite my better judgement, I once again decided to race your awful course. As is our tradition, I gathered the night before with my running buddies. We planned our splits and ate Christina’s magic teriyaki noodles that we superstitiously devour before each race. My head hit the pillow meticulously early with last minute prayers for good weather and no injuries. My friend Abby and I were aiming to finish you in under 1:53. 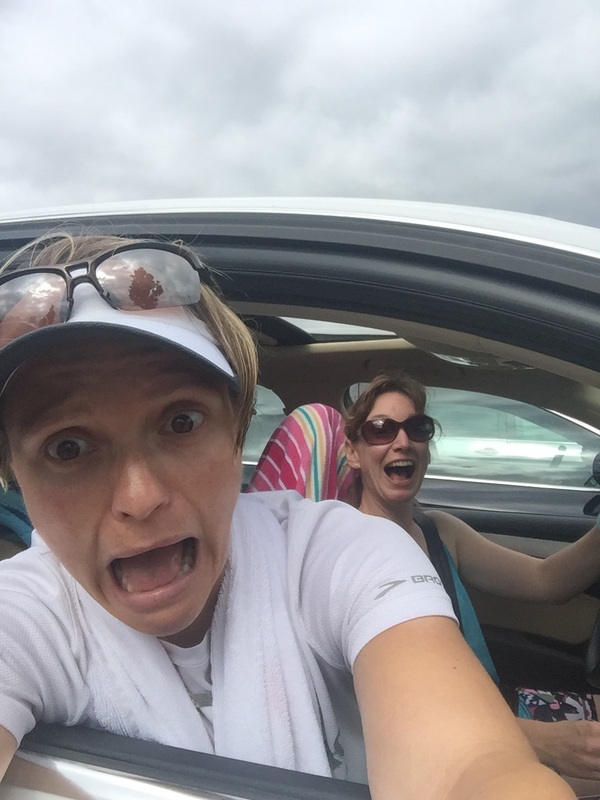 We had been training our quads off getting ready for The Ragnar Relay, and we felt great. When our corral took off we went out strong. We were trying to pace 9:00 min/mile to start, while hoping for negative splits near the end. There was just a few problems: your crowds and your hills. The course was so thick that our first split was 10:04. We were constantly weaving back and forth through all the walkers. Yes, there were people walking at 1 mile. I think the rain delay caused the racers to completely abandon the corral system leading to total chaos. 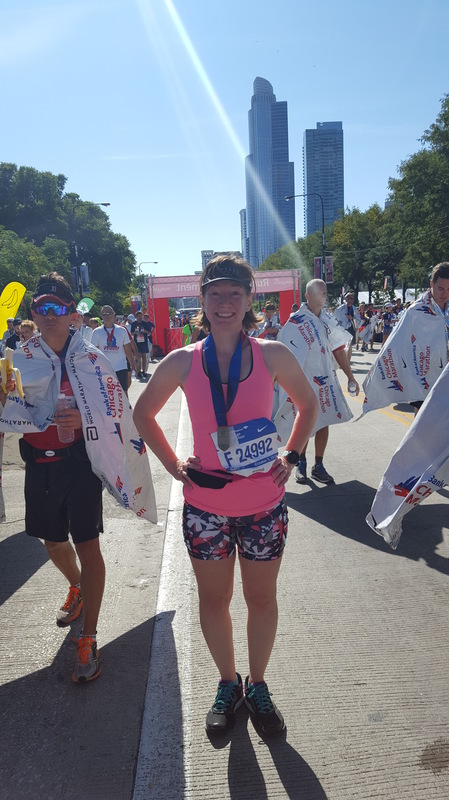 While it was exhilarating to not get passed once in the race, it was also exhausting and frustrating to expend so much energy weaving around slower runners. I know, CMM, that you think you are so awesome for attracting so many first time racers, but it’s a little annoying when they walk in a full width line in the middle of the road going uphill. It was impossible to keep my stride. Twice during the race I accidentally ran into other runners. Which brings me to the other issue I have with our relationship: Your hills. Every year I think to myself, “I train on hills all the time, I’ll be fine on the country music course” and every year I curse you and your excessive elevation changes. You were especially nasty this year by adding that curved hill at mile 12. 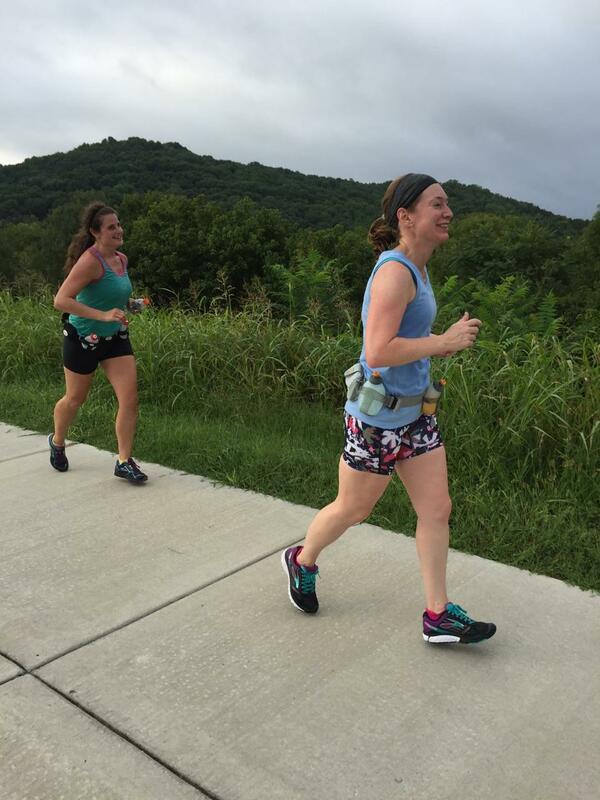 Because turns and hills aren’t enough on their own, you thought you would combine them in the last mile to make sure that both my lungs and thighs were searing with equal amounts of pain as I cross the finish line. I think mile 12 was when I decided that we would have this little talk. While I did finish with a respectable time of 1:54. I could have easily been a minute or two quicker on even a slightly less crowded, hilly or weaving course than yours. My friends Shannon and Christina both finished the full 26.2. They did an awesome job despite your hilly drama, but I think they may be finished with you as well. My friend Shannon rocked the full 26.2. I’m not saying that we can’t still be friends. You will always be special to me. You were my first marathon. I do love running the streets of Nashville, I just don’t love running them as fast as I possibly can. We’ll still hang out. If we didn’t, I’d miss the bands at each mile, music row, the Gulch and my favorite: the awesome retired couple that sit in their lawn in all dressed up drinking champagne while cheering on the runners. So sorry sweetie, we’ve had a good run, but it’s over. And, yes if you must know, there is someone new in my life. His name is Chicago and I am running him in October. Don’t worry, you will always be my first, and we have had a lot of great memories together–but it’s time to move on to a course that is doesn’t have such hilly drama. It is a long distance relationship, so that could cause some issues. I promise to keep you updated. 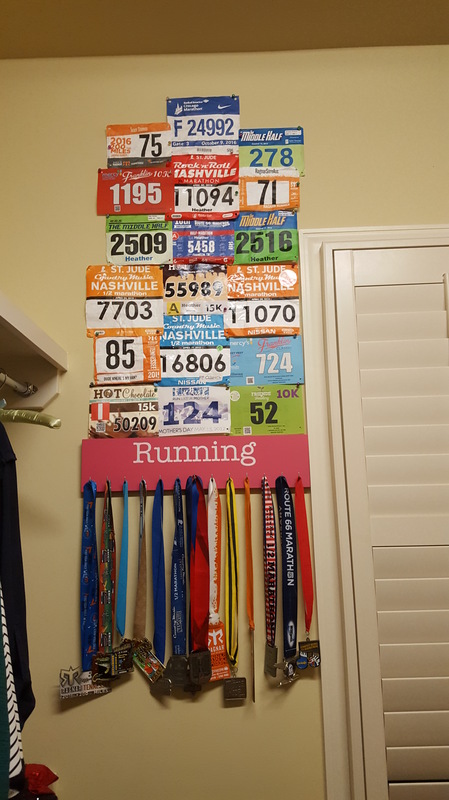 This entry was posted in Humor, Running and tagged Chicago marathon, country music marathon, marathon training, nashville rock n roll marathon on May 1, 2016 by drrupe.